If aliens arrived tomorrow, we would have a lot to explain about the bizarre practices humans engage in. We smack our hands together to express pleasure and gratitude. We put our mouths on other peoples' mouths if we like them a lot. We put human clothes on cats, despite cats clearly having no interest in wearing anything. 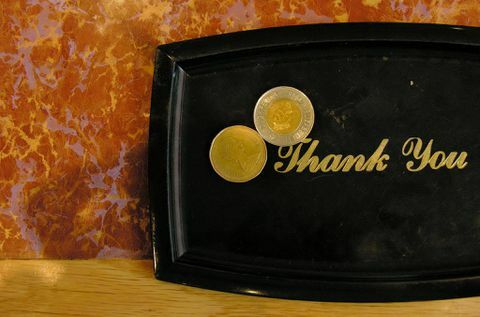 Perhaps the strangest of common practices, however, is tipping. Consider this: When you order a drink in a bar or a meal in a restaurant or ride in a taxi, you're expected to pay for the drink or food or car ride. This makes sense. Then, however, you're obliged to pay an extra amount, more or less at your own discretion, for reasons mostly unclear. How much one is expected to tip depends on a number of factors, including but not limited to: how much you like the person who sold you the drink or food or drove you home; the taste of the meal or the drink or the condition of the car; whether/how much your server or driver seemed to like you; the overall presentation of said server or driver. Unsurprisingly, tipping has been shown to reveal our hidden biases regardless of what we think of the service we receive. Researchers at Cornell University in New York State found that African-American servers earn lower tips on average than their white counterparts, while female servers with blond hair average higher tips than those without. Even more unfair than the factors that influence how much we tip is the arbitrariness of the people it applies to. Coffee-counter worker: Tip. Fast-food-counter worker: no tip. Hotel bag porter: tip. Hotel check-in desk: no tip. Airport bartender: tip. Flight attendant: no tip. The more one thinks about tipping, the less sense it makes. There's no "why" to it except that's just how it's done. Tipping may have made more sense when the European aristocracy began giving money to the servants who waited on them hundreds of years ago, but given how much the service industry and the structure of society have changed since then, the continuation of this practice just seems bizarre. While some argue that tipping ensures good service, there's no evidence that the waiters we tip work harder, or are more deserving of a bonus than the dishwashers, prep cooks or housekeepers behind the scenes who make do with an hourly wage. As we move deeper into the smartphone era, apps enable us to pay for hotel stays, cab rides and food with the touch of a screen, with service charges and convenience fees automatically added onto our bills. While our apps spare us the indignity of having to calculate 18 per cent of $53.35 after a couple of glasses of wine, tipping remains as much a part of the new economy as the old one. These guidelines for common scenarios shed some light on the murky waters of gratuities in 2018. While convention dictates leaving a tip for valets, bag porters, room service, concierges and housekeeping at hotels, Airbnb and VRBO mostly dispense with these, charging only a flat cleaning fee. While Airbnb doesn't have an official stance on tipping, VRBO doesn't discourage the practice of leaving a cash bonus if a host goes the extra mile. "Certainly, some owners or property managers go above and beyond to provide a service that is worthy of a tip, stocking the fridge with the guests' favourite snacks, or arranging tours and activities," says VRBO's corporate communications manager Jordan Hoefar. For the privilege of having food brought to your doorstep, services such as JustEat, Foodora and UberEats all charge a delivery fee with an option to tip. "We think from a consumer-behaviour perspective, it makes more sense to pay a delivery fee and give the customer the option to tip the courier whatever they want," says David Albert, Foodora's managing director for Canada. The average gratuity is $3.30, he says, all of which goes to the courier. Ride-sharing juggernaut Uber rolled out its game-changing service without a tipping feature, but eventually caved to criticism from drivers and added the option. Lyft, positioning itself as the good cop to Uber's bad cop, has included tips since its inception, but declines to offer an opinion on how much is customary or acceptable. "It's entirely up to the passenger whether they would like to tip and how much," says Lyft spokesman Campbell Matthews. Leaving a dollar or two on a takeout order is standard. This practice persists in popular food-pickup app Ritual, although the company won't offer a comment on how much of a tip is customary. At General Assembly, a new fast-casual pizza joint in downtown Toronto, however, tips are expressly discouraged for both takeout and dining in. Following the lead of American industry leaders like Danny Meyer, Thomas Keller and Alice Waters, owner Ali Khan Lalani chose to go tip-free as a way of creating fair pay for all of his staff, not just the ones interacting with customers. "Removing the wage gap between the back of house and front of house was really important in creating what I thought was a healthy work environment," he says, adding that his staff earn between $14 and $23 an hour. Among the most recent arrivals to the order-by-app scene is Soothe, a Los Angeles-based company that links customers with professional massage therapists for in-home or in-office treatments. While the company launched with a tip-free model, by the time it arrived in Canada late last year it had revised its payment system to include an optional tip at the end. While you're welcome to leave as much or as little as you like, the app suggests a minimum of 15 per cent if you're happy with your massage.